Jazz at the Pizza Express, Dean Street. You’re in the north east, you’re thinking that’s a long way to go for a pizza. Think again! The Pizza Express, Dean Street, Newcastle has decided to give jazz a try. The pizzeria put on a regular jazz gig a few years ago in conjunction with the then fledgling Jazz Coop but it didn’t really take off. Let’s hope this new venture will enjoy greater longevity. The plan is to establish a regular night in the upstairs room. The first gig will be on Friday October 23. Doors open at seven o’clock, with the band on stage at 8pm.. 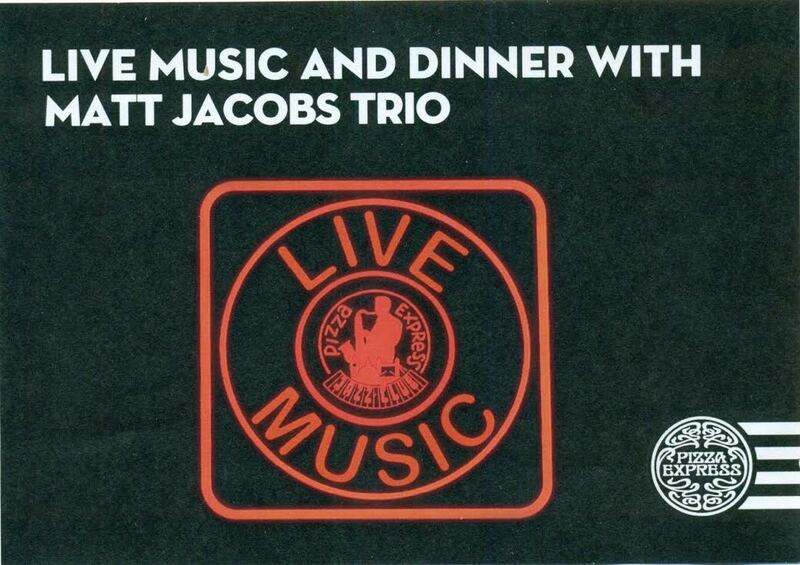 The good news is they’ve lined-up some tasty gigs to complement the menu; starting with the Matt Jacobs Trio. Jacobs is the pianist with the Durham University Big Band. The trio can play, make no mistake about it. Friday Oct. 23 - Matt Jacobs Trio. Free. Wednesday Nov. 11 - Mo Scott Trio. Free. Wednesday Nov. 18 - Durham University Big Band - £5. Monday Nov. 30 - Pocket Jazz Orchestra. Free.